product Specification: Operating Voltage: 110 VAC Up to 100,000 hours of operation Time. Animation ON/OFF switch button. UL approval power cord. 8 watt power consumption which is at a very good energy efficiency. Light weight and easy to install. Safe to touch and operate. For indoor use only. Dimension Measurement: 19"L x 10"W x 1"H A metal hanging chain is included. this is a brand new Open LED ATM sign. These ultra bright LED signs are brighter than the neon sign and highly visible even under daylight, a business store owner can use it to attract large volume of foot traffic to their shop. These animated LED signs has much lower energy consumption rate than the similar neon sign products. These reliable LED signs can be left on for 24 hours a day, 7 days a week and be operated for a long period of time. 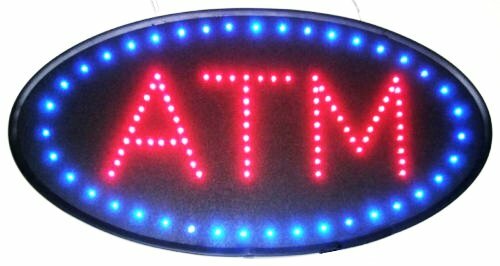 LED sign products are quickly becoming a must have item for business store owners. Product Specification: * Operating Voltage: 110 VAC Up to 100,000 hours of operation Time. * Animation ON/OFF switch button. * UL approval power cord. * 8 watt power consumption which is at a very good energy efficiency. * Light weight and easy to install. Safe to touch and operate. * For indoor use only. * Dimension Measurement: 19"L x 10"W x 1"H * A metal hanging chain is included. 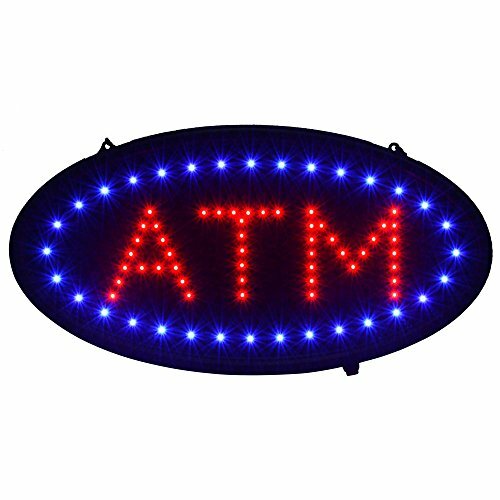 Advertise the presence of an ATM machine from a distance to potential customers with this oval shaped LED sign. 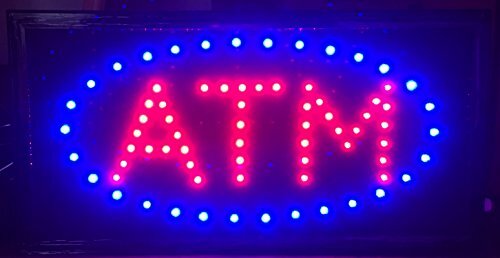 Bright neon blue and green bulbs illuminate the word ATM with 3 different lighting patterns. LED or light-emitting diode technology, is very bright and consumes less energy in comparison to neon signs, allowing it to be kept on for long periods of time. Hanging hardware and 12V adapter is included. Dimensions: 27" x 15" x 1-3/4" Weight: 4 lbs. 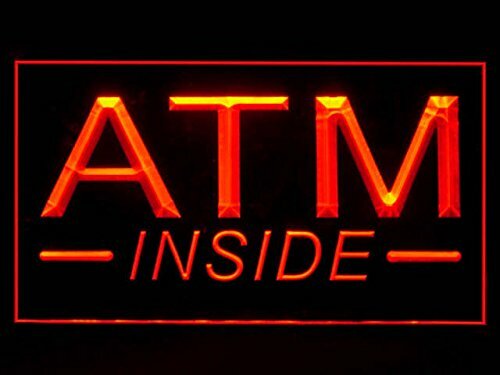 This ATM sign is designed for placement in a storefront window or doorway. The hanging LED sign includes chains for effortless installation upon receipt. 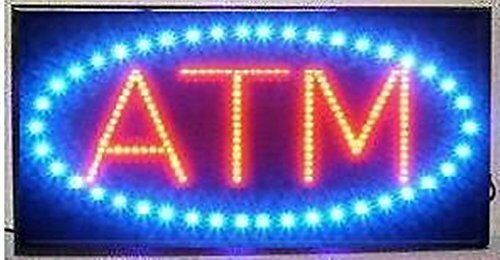 The ATM sign uses LED bulbs placed behind epoxy letterings to create a smooth, crisp presentation viewable from far away. Unlike neon business signs with exposed LED bulbs, this hanging storefront sign creates an easy-to-read display that looks professional yet striking. 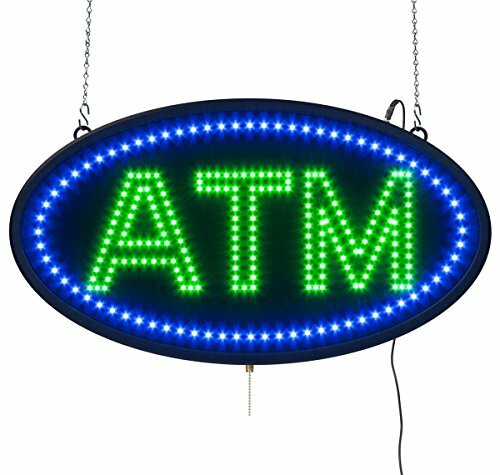 The vibrant blue and green ATM sign remains illuminated at all times until the power button is pushed - no blinking or flashing functions to distract customers. 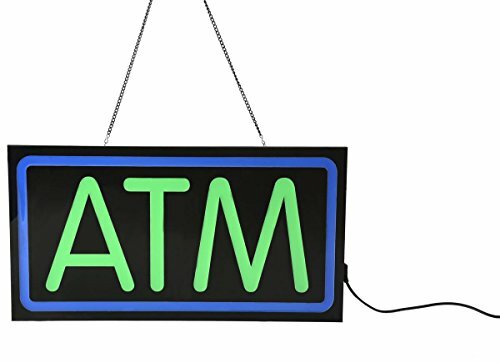 The hanging LED sign also has wall-mounting hooks if users prefer to attach a unit to the wall instead.Dimensions:Overall: 17"" x 9"" x 1""Weight: 1.5 lbs.Chain Length: 37""Power Cord Length: 105""
Bright Animated Motion LED ATM Neon Sign Bright Restaurant Shop Store 19" x 10"
LARGE Animated LED ATM LED Neon Sign Bright Restaurant Shop Store 21" X 13"
LED Neon Light ATM Business Sign With Remote Control. 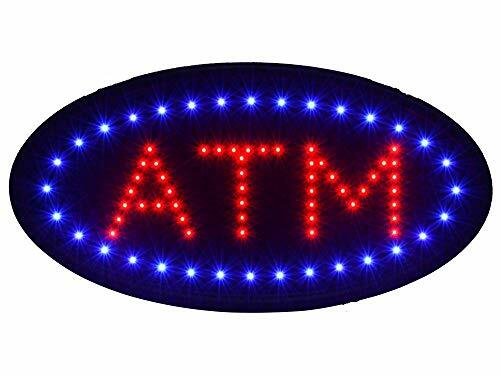 Want more Atm Led Sign similar ideas? Try to explore these searches: Crocheted Doilie, Standard Hobby Tool Set, and Corsage Brooch.